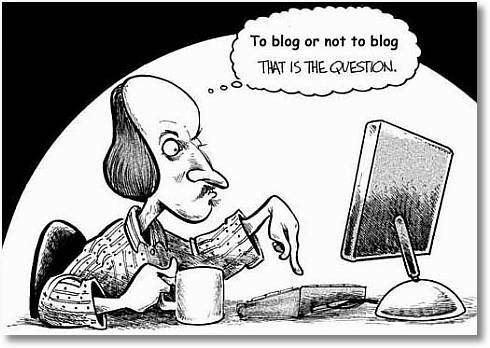 Léna Roy: To Blog or not to Blog . . .
And by sharing, feel less alone . . .
Oh my blog, how I've missed you of late, my life filled with other parts of the writing life, teaching and meetings and emails - oh, so many emails! Yet I want to thank you for being a place where I can organize my thoughts, and where I can have a meeting of the minds with others. But we need to have some boundaries, you and I. Internet traffic has become very congested and if I am overwhelmed, others must feel the same way. So I will blog on Mondays. (Yes, I know that it is Tuesday dear blog, but yesterday I led five workshops! Okay, so I'll write Sunday night. Happy?) Therefore you, dear readers, hopefully won't become overwhelmed with moi and run away. So yes, I will still be baring my soul in the same fun-loving way, and I'll try not to suffer my slings and arrows alone, but rather write about them to give them some perspective. And I reserve the right to blog more if I want to!!!! Oh goodie--a regular dose of Lena! Looking forward to your thoughts on Mondays! Still here. Still reading. Monday it is. mwah! Sounds like a good plan. Gotta make time for life or what is there to blog about? Sounds like a plan--a flexible one, which is the best! And here's the irony -- if you had posted on a Monday prior to this one (April 23rd), you would have honored the birthday of the Bard himself. But you knew that -- right? I spaced the Bard's birthday this year!? Man I have been busy. He was nudging me then, wasn't he? I know there is a set of blog "rules" somewhere and frequent posting is one of them that I violate flagrantly on a regular basis; who knows what others I ignore? Awash in email, caught by demands of a 40+ hr per week job, the lure of the books on the coffee table, and a habit of dropping everything when a loved one calls or drops by so as to give them my full attention, not to mention (yet I am) housekeeping (such as it is). Well, there you have it, posting once a month is my ambitious goal (not always met!). I admire your once a week (reserve the right to blog more)stance! Thank you so much for stopping by and saying hello Connie! The "rules" are always changing, aren't they? But I have been feeling overwhelmed by everything and then there's so much I want to read! I really appreciate you taking the time to read my words. Thank you!